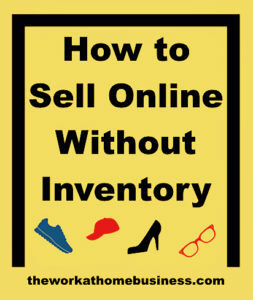 Learning How to Sell Online Without Inventory is Not Difficult. The focus of this post shares 3 ways on How to Sell Online Without Inventory. Matter of fact, you can start any of these models with little or no money. Key point is that you don’t need to handle the products. Of course, there are limitations so I’ll look at the pros and cons. Indeed, Amazon is a gigantic marketplace. Surely, it is probably the easiest and best place to start selling online without inventory. As a result, it is super popular for many people who want to start an online business. First of all though, you need to join the affiliate program. By the way, it’s good to at least start your own website before you sign up. As a matter of fact, think carefully before you build your website. Having a clear vision about what you want your website to be about is very important for your online business. For sure, you want to show Amazon that you are serious about being an affiliate with them. And of course, they want your business too. Once you get their approval, you can start promoting other people’s products. Ideally, having the products on your own website is a good thing. Nevertheless, you can use other forms of promotion. For instance, you can use YouTube videos. Writer’s Note: In case you would like to start your own online business, CLICK HERE and learn for FREE. Despite the fact that the commissions are low, you can still earn money. Most important is that you work hard at promoting the products. Likewise, traffic to your website and/or YouTube channel is a key factor. Not to mention the products you choose. Here is the “Associates Program Standard Fees Schedule.” Using this guide, you can select the products that you think would be better for you to earn higher commissions. 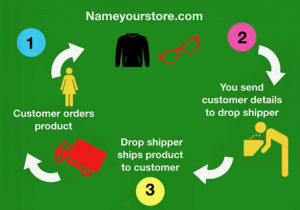 Chiefly, when you start a drop shipping business you expect to get orders from customers. Again, it’s good to have your own website for this business model. Soon after you take these orders, you convey them to the drop shipping distributor. In return, the distributor’s responsibility is to pack and ship the products to your customers. Obviously, you don’t carry any inventory. Basically, you are the “go-between” person for the buyer and the distributor. Key point to note is that the name of your company and logo goes along with the order. That is to say, your client will get the impression that the product is coming directly from you. For one thing, this Drop Shipping business seems too good to be true. Therefore, it is best to know the positive and negative sides. Given these points about this Drop Shipping business, there can be challenges. Amid the caveats about drop shipping, you can try SaleHoo to see if their model can work for you. If for any reason, you don’t like the model, you can CLICK HERE for my # recommendation. Notably, the services of Third-party Logistics have to do with outsourcing. Basically, third-party logistics can store your products and also fulfill orders. Additionally, 3PL also offer support to your customers including returns. Even if you use a 3PL, you may want to create your own website. Important to realize that using the services of a Third-party Logistics requires financial backing up front. That is to say, you need to purchase the products you want to sell. Then you ship these products to the 3PL warehouse. Generally speaking, if you want to have an online store, but don’t want to handle the products, then you can use the services of a Third-party Logistics. Overall, this service frees up time for you to focus more on your store. Overall, if this business model suits your needs, you can learn more about the services of a good 3PL. Comparing the cost and the services they offer can help you to get going. You can check out the services of the following Third-party Logistics. efulfillmentservice.com offers an award-winning service with no set up fees. By the same token, they offer prices to suit your needs. directoutbound.com has many direct lines to carriers from all over. Hence, they can ship products to customers within a very short time. shipmyorders.com is one of the fastest growing 3Pl’s. The company has no limits on your transactions. alivefulfillment.com offers integration with Shopify. They do not have limits on their prices. warehousingandfulfillment.com finds warehouse and fulfillment companies for you. newgistics.com brings cutting edge technology to help with your fulfillment needs. Important Note: By the way, Amazon offers Third-party Logistics services too. In case you want to sell on Amazon and use FBA, the company can fulfill orders from your website. One key point to note is that Amazon ships the products in their own Amazon box. If you want the products to ship out in your own box, that’s added cost. Don’t think you like this model? CLICK HERE for my # recommendation. Your advice to think carefully about your web site and what you want it to be about is well advised. Amazon approval is not a sure thing, and you want to make sure that first shot is your best one. While I am familiar with Amazon, I know very little about drop shipping, and absolutely nothing about 3PL, so this was very helpful, particularly the pros and cons section. Thanks for visiting. Knowing exactly what you want to focus on is so important. If you are not sure of what you want, I don’t think anyone should rush it. Rather, they should take some time and give it thought. Finding your article just in time! I’ve been researching the dropshipping business for a while now, really interested in it. Considering that you suggest its business model for a suitable solution, I may give it a try as well. I appreciate that you point out the cons of the dropshipping business as well, most of the people tend to get caught up only with the Pros. Love the article, tons of valuable information that I will put in good use. Good to know you found this post helpful. I have written a few other articles on drop shipping, so you may want to check them out. What a well thought out article! I was impressed and suprised by the the information regarding 3PL services. I think that these services would be a good thing to start your online business. Thank you for sharing! Anything that can make things easier for you is worth trying.